Home / Editor's Choice, Entertainment News, Featured Articles, Gossip and Drama, News, Politics / MOSES KURIA is a thief! A journalist reveals how he stole his phone worth Ksh 46,000. MOSES KURIA is a thief! A journalist reveals how he stole his phone worth Ksh 46,000. 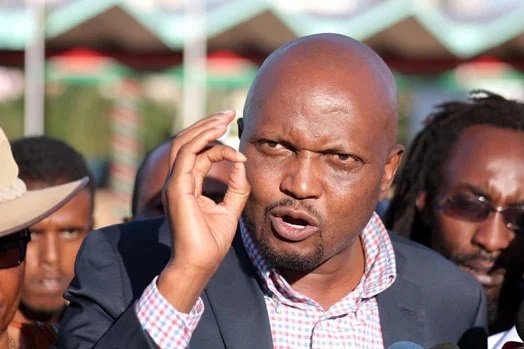 Friday, September 14, 2018 - A media consultant has accused Gatundu South MP, Moses Kuria, of stealing his phone worth Ksh 46,000. According to Dan Muhuni, an old friend and former media consultant of the controversial MP, Kuria snatched his Tecno Camon CX 32 GB Phone worth Ksh 46,000 from his hands at DCI headquarters. At first, he thought it was a joke but Kuria refused to return it and when he kept on demanding to have his phone back, Kuria threatened him. Muhuni reported the matter at Muthaiga Police Station and the last time he called Kuria, he told him to go to his grandmother’s toilet and get it. “I hear he owns a chopper and this was confirmed by Deputy President William Ruto the other other day. Why he has he stolen my phone,” the journalists asked. When reached for a comment by a local publication over the matter, Kuria bragged, “My friend, I am too senior for those stories kama ya Muhuni. Akwende huko.” . Muhuni has vowed to get his phone back from Kuria by involving the Director of Criminal Investigations.